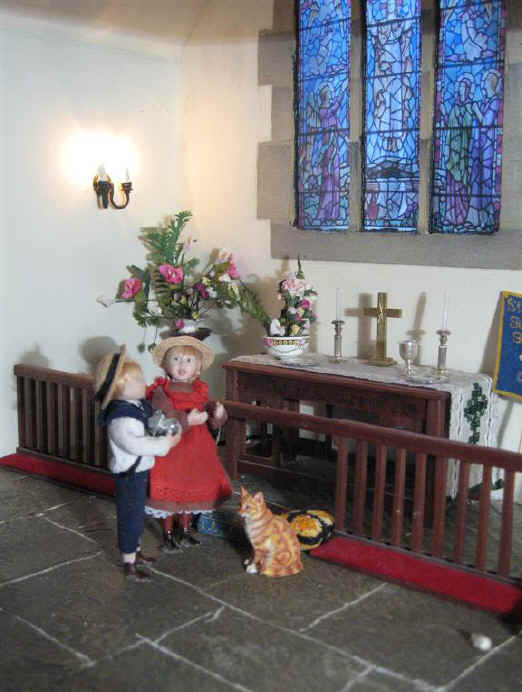 The children of St Hilary's Sunday School welcome you to their very own page of news. Here you can read all about the things that THEY want you, their visitors, to know! Isn't the vicar kind to let them have one page ALL to themselves. 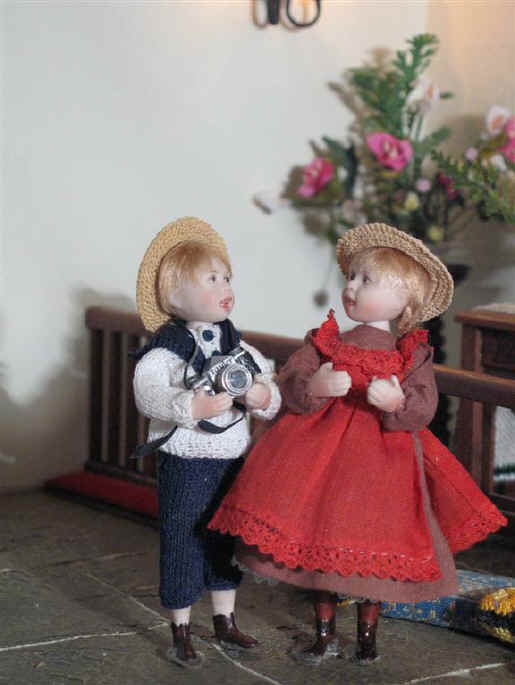 They are so looking forward to telling you THEIR stories about their recent adventures. We have currently got stories from both Tom and Alice! Read below what they have to say! 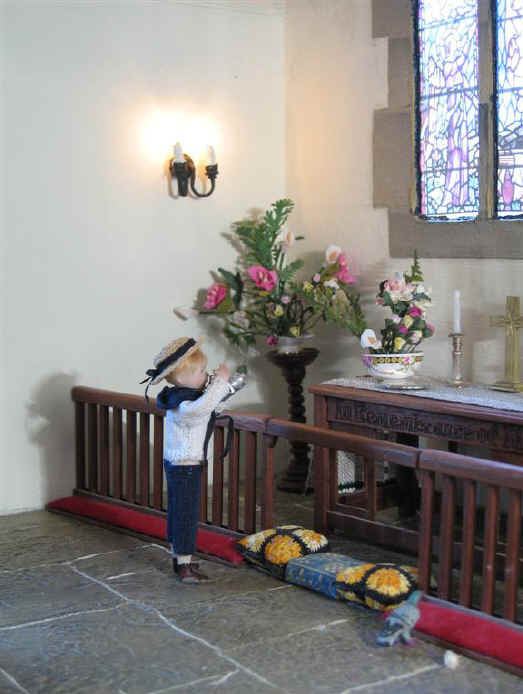 The children visit the Autumn 2009 Miniatura - this will open in a new window! Tom has taken up a new hobby! I have been so excited recently because a new boy started coming to church who is not much older than myself. He is called Ambrose and he is the son of one of the farmers who's farm is next to the church! Ambrose always makes me laugh because he NEVER has buttons on his shirt that are all the same colour. I have offered to buy him some shoe laces too because his father isn't very well off and can't afford to buy him any. He said that he is most happy with his shoes even though they have no laces and, as he pointed out to me - they have NEVER fallen off his feet, not even once! I think that he may like me because he always wants to sit next to me in church. He has even asked Miss Esther if he can become a Sunday School helper just like myself! 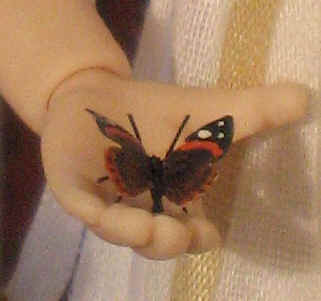 Did you notice that Ambrose even came into church on this one day with a little butterfly perched on his hand? He really loves all living things and I never know what he will present to me next! So when he insisted on showing off this living butterfly that was so happy to sit on his hand I was fascinated. The butterfly was just beautiful and we both stood for ages just gazing in wonder at it. It made us both think how wonderful God must be to make such a beautiful but tiny creature that is perfect in every way. I had to laugh when Ambrose walked into church to find me. You see, he loves animals, but they also seem to love HIM too. So it was very funny to watch this lady duck and her boyfriend duck follow Ambrose as he came in. They just waddled in happily after him and then stood in front of us. I don't know what they thought they were waiting for though! WHO should come in to the church shortly after Ambrose but the vicar! He saw that Ambrose was holding a butterfly in his hand. He told Ambrose that it may be a good idea to walk carefully out of church and let the butterfly go free. Ambrose, however, was wondering what kind of butterfly it was before he went and let it go free. The vicar also loves all living things and was able to tell him that the butterfly he caught in the church yard as it was perched on a flower was a Red Admiral. Ambrose then walked out of church EVER so carefully so as not to frighten the butterfly and then let it fly back into the church yard where he found it. I was kind of chuffed that Ambrose wanted to come back into the church for another chat after letting the butterfly go free in the churchyard. 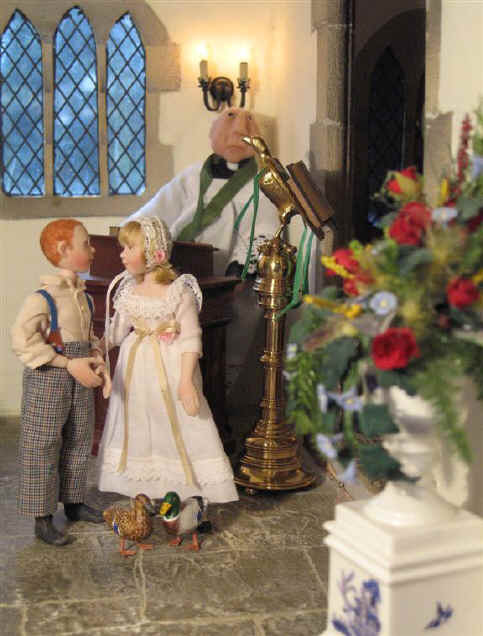 Do you know - we chatted together for AGES and AGES before the vicar suggested that Ambrose's father would be wanting to see him back as there would be chores for him to do on the farm. I have always wanted to be allowed to have a camera and take photos. When St. Hilary's had a new chancel and sanctuary extension built and a new stained glass East Window I was dying to take a photo of it all. Do you know what? My Mummy went to speak to my Granddad about me wanting a proper camera. He was really interested to know that because he also used to love taking photographs. Granddad has now let me borrow his own camera to try and learn how to take photographs myself. You can see me here as I look hard at the new stained glass window whilst trying to decide how to photograph it. Adele must have heard that I had brought my Granddad's camera to church and she wanted to have a good look at it as well! I was not too keen to let her hold it though because I was frightened she may drop it and break it. If she did my Granddad would be SO cross with me! Although I was too frightened to let Adele hold the camera I loved showing it off to her! Adele then kept telling me that she was SO jealous of my camera she was going to ask her Daddy if SHE could have one too! Adele insisted I gave another demonstration as she was watching! I just loved showing it all off to her as you can see. Still she begged to hold the camera but I had to refuse. I didn't realise that someone else had come into church as well as Adele - can you see who had come to watch us both? It was Robert Alexander of course! 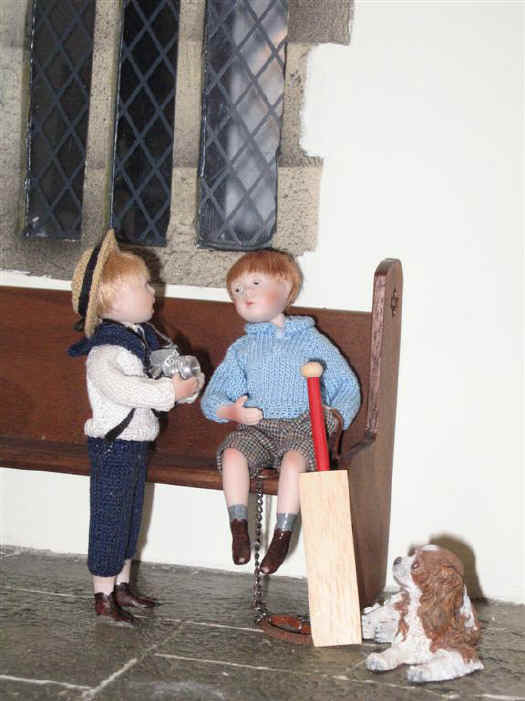 Robert Alexander had been naughty and brought his pet dog and new cricket bat into our new church chancel! I thought I would go and show my camera off to him because I was sure he would love my new camera too! However he said he was more interested in his new cricket bat that his Mummy had bought him! 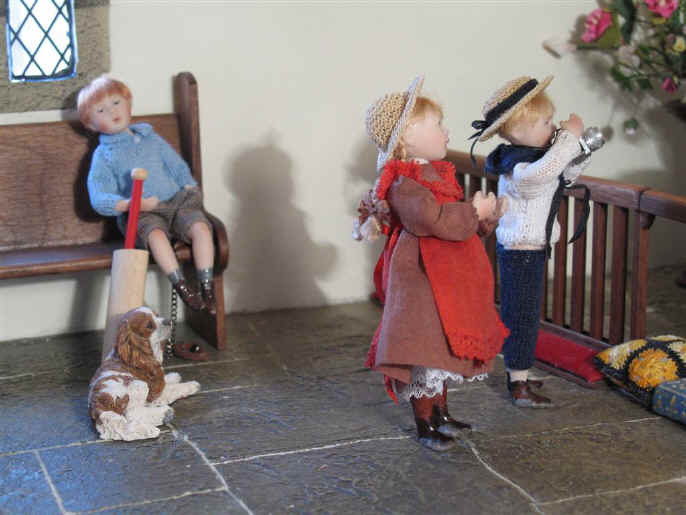 He said it was far more fun playing cricket in the fields with his pals than looking at MY camera. Boy was I cross with him for not loving my new camera as much as I did! Priscilla Jane had come into the new chancel area after Adele had told her all about my new camera! I had told Adele not to tell too many of the other children about my new camera because I didn't want them to all want to play with it at once. Adele can NEVER keep a secret so I was not too surprised to see Priscilla Jane come over to see me. She was so keen to hold my camera she said she wanted to take my mine and Robert Alexander's photograph. What is a boy to say to that but................YES PLEASE! She knows how to get her own way does Priscilla Jane! 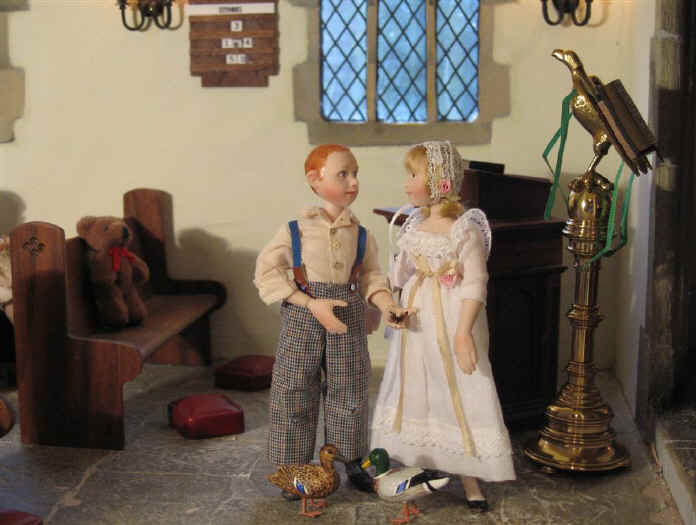 The Red Admiral butterfly and pair of mallard ducks are made by Sadie Campbell of Tiny Tails Miniatures. The miniature camera was made by Dave Taylor.